OK, this is one of the problems with writing fiction: the temptation to fictionalise what should be a purely factual blog occasionally proves too strong. 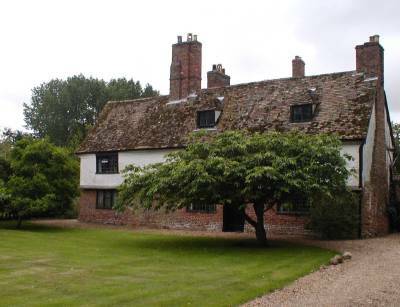 But it’s very easy to visit Pepys House at Brampton, Cambridgeshire, and imagine Sam and Elizabeth as a modern-day metropolitan couple, escaping at weekends to their delightful little country cottage, where they’d merrily quaff Chardonnay on the terrace. The front wing of the house is the part that they would have known, a sturdy early 17th century yeoman’s house; a somewhat larger building was attached to the back in the 18th century. The house was owned by Sam’s uncle Robert, who worked for the powerful Montagu family just up the road at Hinchingbrooke, and was inherited by Sam’s father John. It’s likely that young Sam lived there for at least a couple of years in his childhood, when he attended nearby Huntingdon Grammar School (star alumnus = O. Cromwell), and in the 1660s he installed his parents and his sister Paulina there. Sam visited from time to time, and occasionally sent his much put-upon wife Elizabeth to stay with her father-in-law (the two didn’t get on). On 9 October 1667, he wrote in his diary that he found the house and garden ‘very pretty, especially the little parlour and the summer houses in the garden, only the wall doth want greens upon it, [but] the house is too low-roofed, but [this] is only because of my coming from a house of higher ceilings, but altogether very pretty, and I did bless God that I am able to have such a pretty place to retire to…’ On another occasion, though, he complained of ‘the biting of the gnats by night’ – Brampton being on the edge of the flat, wet, marshy landscape of the Fens. The house’s most memorable appearance in the diary comes slightly earlier in 1667, when the Dutch fleet was in the Thames, attacking the dockyard at Chatham, and there seemed to be a very real prospect of invasion. On 13 June, with news of the taking of the Royal Charles ringing in his ears, Pepys despatched to Brampton his wife, father, the four bound volumes of his diary to date, and some £1300 in gold. In October he went up to retrieve the money, which his wife and father had buried in the garden. There followed a hilarious three-way spat in the night-time, illuminated only by a single lantern, with John and Elizabeth arguing over exactly where they had buried it while Sam got more and more anxious and angry: ‘but Lord, what a toss I was in for some time in, that they could not justly tell where it was, that I begun heartily to sweat and be angry that they should not agree better upon the place, and at last to fear that it was gone’. Even when they finally found the right place, he berated them for not burying it deeper in the ground, and choosing a spot that was overlooked by neighbours. Worse, the damp conditions had caused the bags to burst, leading to the loss of about 100 gold pieces, ‘which did make me mad’. Desperate to prevent the neighbours – who, he thought, were bound to have heard the nocturnal argument in the garden – sneaking in and finding the missing coins, Pepys went out again and managed to retrieve another 45. Several subsequent expeditions have failed to locate any of Pepys’s missing gold! The house is currently on a long lease to the Samuel Pepys Club, which was founded in 1903 to perpetuate the diarist’s memory. Initially restricted to 70 members, a number corresponding to his age when he died, it subsequently expanded to 140, although membership remains by personal application, supported by a proposer and seconder from within the club, followed by election. The membership includes a number of overseas members, but all are united by their interest in aspects of Pepys’s life and times. I joined several years ago, had the honour to receive the Samuel Pepys Award (which was instituted by the Club) in 2009, and currently serve on the committee; indeed, it was a meeting that took me to the house. This remedied an utterly shocking and shameful omission on my part – although I’ve lived within 20 miles of Pepys House for over 25 years now, in fact for almost as long as I’ve been working on Pepys and the navy of his day, I’d never actually visited it before. Because it is possible to visit it, although finding out how to do so is a significant test of initiative! The house itself is identified only by the tiniest of name plates on a gate post, while the visitor information is tucked away on the somewhat rickety website of the Samuel Pepys Club. But I thoroughly recommend it – the delightful tenants, Mr and Mrs Curtis, will entertain you royally, while a visit to Brampton can easily be combined with one to Huntingdon’s Cromwell Museum, housed in the school building that Pepys and Oliver Cromwell attended, and to Hinchingbrooke House, the mansion of the Montagu family, including Pepys’s patron, the first Earl of Sandwich (the house is now a school – indeed, I had my first ever job interview there! – but is open on certain days during the holidays). And if you do go, say hello to the Pepyses for me! That pun really is below you!